Welcome to UNC Charlotte's Primate Behavioral Ecology Lab! The newly created Primate Behavioral Ecology Lab at UNC Charlotte focuses on spatial ecology and vocalizations. While much of our work to date involves the white-handed gibbons living in Huai Kha Khaeng Wildlife Sanctuary in western Thailand, we hope to expand this in the future to include various species and multiple locations. My research interests focus on the behavioral ecology of living primates, examining the ecological and biological factors that may have influenced life in our own deep evolutionary past. I am interested in exploring ecological explanations for within-species behavioral and dietary variation as well as the evolution of pair-bonds and pair-living social systems. For my dissertation, I combined behavioral data collection techniques with remote sensing and GIS methods to examine how gibbons, small endangered apes living in Southeast Asia, cope with challenging ecological conditions through modifications in ranging behavior, diet, and social behavior. My earlier work has examined nutritional stress during pregnancy and lactation and mother-infant interactions in captive baboons. Maggie received her BA in Anthropology from UNC Charlotte in 2017 and is now second-year student in the MA program at UNC Charlotte. She conducted her thesis research on ranging patterns of white-handed gibbons living at Dr. Light's field site in Huai Kha Khaeng Wildlife Sanctuary in western Thailand. 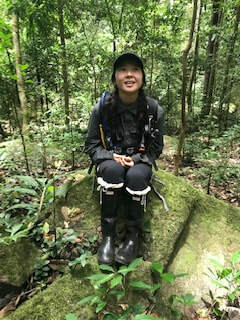 Her thesis is titled, "Moving right along: The effect of habitat type on ranging patterns in white-handed gibbons (Hylobates lar) in Western Thailand." I graduated with my Bachelor’s in Biological Anthropology from William Peace University in 2013. After graduating, I took graduate courses through a non-degree studies program in forensic anthropology, osteology, statistics, biology, and primatology while working as an Anthropology tutor and Biological Anthropology lab assistant. I decided to pursue an education in primatology in part because I was able to volunteer and work as a Husbandry Intern with the Duke Lemur Center. I am interested in primate conservation and vocalizations, and am currently working on my Master’s thesis, titled “The effects of meteorological variables on the great calls of white-handed gibbons (Hylobates lar) in Western Thailand." I am currently enrolled as an Early Entry student in the MA program at UNC Charlotte and expect to complete my BA in Anthropology this spring. Last summer, I traveled to Dr. Light's field site in western Thailand and collected data on gibbon vocalizations. I have just recently presented results from that research at the Undergraduate Research Symposium at the American Association of Physical Anthropologists Annual Meeting. The poster presentation was titled, "​Gibbon Chatter: a vocal analysis of male white-handed gibbon solo calls." I am a current student at the University of North Carolina Charlotte studying operations and supply chain management with a minor in anthropology. I have always loved archaeology and took some introductory fieldwork classes when I was younger. In those classes, I noticed areas that could be improved such as transport, data management, and supply logistics. In my first year of college, I decided to major in operations and minor in anthropology in order to get a better understanding of how to move supplies and people internationally. Additionally, there are many new and exciting technological advances that are being used in logistics that can be applied to archaeology businesses moving resources around the globe. My goal is to graduate and gain experience in global logistics, then take what I have learned and apply it to archeological project logistics. ​I am a senior at UNC Charlotte majoring in Psychology and minoring in Anthropology. I am expected to graduate this May (2019) with my B.Sc. in Psychology. I am hoping to pursue a career in research, specifically mother-infant relationships, interactions, and infant development in wild populations of nonhuman primates, especially in the context of habituation,the spread of human activity, and climate change. I plan to conduct future research on wild populations that are both located far from human populations as well as populations neighboring highly urbanized areas. With these research interests, I plan to obtain a PhD in Biological Anthropology with a focus in nonhuman primates.